You probably know that a position of a secretary belongs to the most popular jobs among women. This means that you should prepare for a tough competition in your interview–five, ten, or even twenty other job seekers will compete with you for the same vacancy. 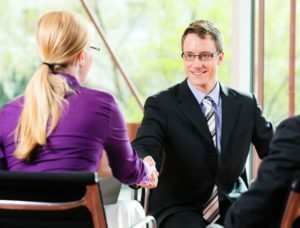 What is more, your success in this interview depends not only on your skills, but also on the impression you make on them, the connection you manage to build with your interviewers (this is true especially if you apply for a job in a small company, and the person who leads the interview is the same person you will work for). What do you think makes a good secretary nowadays? Can you work with MS Office (or with other office software)? If your interviewers feel good with you, if they enjoy the time they spend with you in the office, even average interview answers may suffice you (if you do not compete with ten other people for the job). Oppositely, if they do not feel good with you, if they can’t imagine talking to you on a daily basis, or sharing their office space with you, your exceptional knowledge of MS Office, or your high productivity in work, not to say your excellent interviewing skills, won’t help you to succeed. Bearing it in mind, you should try your best to be a nice companion in the interview, a good listener. You should also show enthusiasm for the job offer, and for their business–the products or services they sell. Be attentive to their needs and their questions. Right body language in an interview is the key. You should simply try your best to convince them that it will be a pleasure to have you onboard as their new secretary. Let’s have a look at some questions now, and how you should answer them. Managers prefer to hire honest secretaries. To say that you are looking for a solid job and good relationship with the boss is a good answer. You can also say that you enjoy doing what secretaries typically do in their daily job. The key is to show them that you want the job, and not only need one. Don’t forget to speak with enthusiasm, and try to avoid talking about the past. Don’t say that you want to work as a secretary becasue that’s what you’ve always done. Focus on relevant skills. Responsibility, positive attitude to work, ability to understand the orders, ability to adapt, loyalty to the employer, etc. Alternatively you can summarize a role of a secretary in a single sentence, saying that a good secretary makes the job of their boss easier, and more pleasant. They help them to be more efficient in what they do, on a daily basis. Special Tip: Would you like to see sample answers to the questions? Check an eBook, the Secretary Interview Guide from Jacob Gates, to see great answers to twenty most common interview questions for secretaries … and much more. In a few hours from now, you will be ready to pass your interview with flying colors! Secretaries should not dream of promotion, at least not within the company. Say them that you will be happy to work for them in five years, or somewhere else, doing a good job of a secretary, and enjoying your life outside of work. Perhaps you have a different idea of your future–and there’s nothing wrong with it. But once you interview for a job, you should tell the interviewers what they want to hear from a good candidate for the job. Many people believe that secretaries do nothing but make coffee and answer phone calls. Well, they can’t be further from the truth… You should show a different attitude to your job. Tell them that you plan helping the boss with their schedule, with the administrative tasks, and basically with anything they need. Try to show them that you are ready to manage the entire office–if required from you. It is crucial to show them that you like to be busy in work, and they you prefer a proactive approach to your duties. Try to mention some details. Instead of saying just yes or no, you should tell them how long you have been working with the software, and how it has helped you in your work. If you have experience with other software packages (other than the programs from Microsoft), tell them about it. Show them that you understand the importance of your computer skills, and are constantly trying to improve on them. Want to see fantastic answers to 20 most common interview questions for a Secretary? We highly recommend an eBook from Jacob Gates, an interview coach from Philadelphia. In his eBook called Secretary Interview Guide, Jacob will guide you step by step through the difficult interview process, and show you how to handle every challenge it presents. Interview attire special tips – Some interview attire tips for the brave, and for people who like to experiment. Every detail matters in an interview, and you should not underestimate your choice of clothes.